Ralco RZ Speed Flywheel - Dezod Motorsports Inc - Home of the automotive performance enthusiast since 2002. Ralco RZ Aluminum Speed Flywheels are made with the highest quality 6061 T6 aluminum. Ralco RZ created these polished finish flywheels to be on average 50% lighter than the factory OEM flywheels. 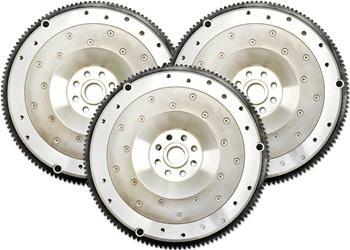 A major advantage this item is that it’s compatible with either stock or aftermarket clutches. There are several major benefits of purchasing the Ralco RZ Aluminum Speed Flywheel for your vehicle. • An aluminum flywheel is the best performance modification you can make to your street or race car. Substituting a light-weight flywheel in place of your stock part enables rotational mass, which distributes your peak horsepower at a quicker response rate when revved up at the starting line. • The Ralco RZ Aluminum Speed Flywheel increases the overall life of your engine. Due to the light weight mass of the flywheel, less stress is applied to the main bearings, sustaining an extended life for your vehicle’s engine. • You’ll never have to resurface your Ralco RZ Aluminum Speed Flywheel again. Simply replace the hassle free, bolt-on steel friction surface plate to save lots of valuable time and money. • Horsepower gains with this product can average 10 to 30 HP over stock levels at the drive wheels. Cut precious tenths off your track time with this quick-shifting, superior performance part. Your vehicle will engage quicker, feel lighter and become more responsive with this carefully crafted Ralco RZ Aluminum Speed Flywheel.